When the rain starts pouring, the only option for outdoor photographers who don't have a weather-sealed camera is to stuff their kit into a glorified plastic bag – which may not even cover the lens. However, now there's a new and far more robust way to protect your gear: the Camera Canopy. 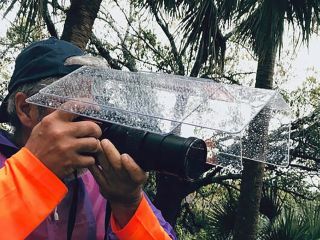 The device was inspired by a small team in Brooklyn, who found that plastic rain covers made it difficult to adjust camera functions and also left lenses exposed. Their solution attaches to the hot shoe and provides a shield that sits over your camera and lens like a roof, protecting it from the elements while not obstructing the controls or obscuring the rear screen or top LCD. Camera Canopy is a two-piece peripheral, where the upper shield can extend or retract to provide cover for telephoto lenses up to 500mm. Alternatively it can be removed entirely, as the lower shield should provide more than enough cover for smaller zooms or prime lenses. The device comes complete with a drawstring backpack carry bag, which naturally is also weather resistant, and is available from Camera Canopy for $79.99 plus shipping. It's the perfect complement for Sony's weatherproof memory cards and OpTech's waterproof tripod leg covers!